Twitter is one of the most popular social-networking and a micro-blogging site which allow users to post tweets of less than 140 characters. Though Twitter is most used by celebrities, politicians, brands and other independent artists but over last few years, there is an exponential increase in the Twitter users. Now even common people are also using it. Google has also partnered with Twitter to show live tweets in its search results page (SERP). When you visit someone's profile, what are the things which attracts you to know more about the person. Of course, it's the profile picture and cover photo. The more professional you look in your photos, the more professional your Twitter profile will be. You can have your photo-shoot done with a DSLR camera by a professional photographer. This will cost you few dollars only. You can also use selfie on your profile picture and that's okay. I have seen many people uploading photos of their favorite celebrity, car, bike or other useless things, which leaves a very bad impression for the first time. As it's your professional page, so you should upload things related to you and your profession only. Also make sure that the picture quality is good and your are indefinable in all group photos. Now come to the editing part. There is no need to edit DSLR photos at all. The only important thing is, focus should be good. While on the other hand, if you're uploading selfie or a normal camera picture, you can apply Twitter or Instagram filters on it. Don't edit it too much and make sure that it looks natural. You can also write motivational quotes inside picture or in the caption with proper attribution. It should be short, simple and unique - Choose a username which is very short and easy-to-remember so that you can print it on your business card and easily share it any where. Don't add numbers and special characters - Make sure that your username is simple. Adding unnecessary numbers and special characters will make it less SEO friendly and hard-to-remember. Avoid using your mobile number and DOB. Add proper keywords - Your username should have proper keywords in it such as your name or your company name. These targeted keywords will make it more SEO friendly and if you're lucky, your Twitter profile may appear in first result page on Google. 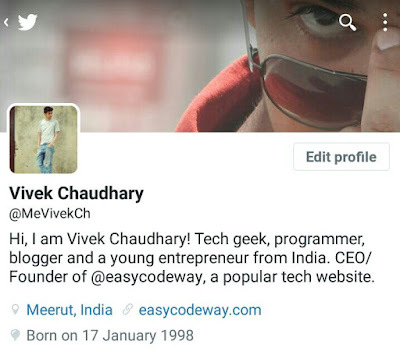 Once you have created and changed username of your Twitter profile, don't change it again in future. If you're using Twitter app on your smartphone, first open your profile and then click Edit button. Now you can edit your name, location, date of birth, website and bio information. Here two things are very important: website and bio. Adding your custom domain website will undoubtedly give you a professional touch. However, if you don't have any website, you can create your free personal page on about.me and then link it with your Twitter account. You have already added your website link in your Twitter profile's about section. If your website is getting huge traffic daily, you can connect it with your profile as well (vice-versa condition). There are a number of widgets available on Twitter's developer site. You can add live-tweets feed in your website and integrate direct follow button. If you publish blog articles on your website, you can add tweet button at the end of the post and pass the author username in tweet description. All these widgets are very fast to load and easy to customize. In case, If you don't want to use any third-party widget (usually to speed up the page-loading time), then you can directly add your Twitter profile link in an anchor text as I do. For example, you can add it in about me or about the author section, where it will drive more CTR (click through rate). You should be active on your Twitter account daily. This is what most of the professionals do. I think there would not be any problem in posting around 3-4 tweets daily, at least. Just tell about what's going on and how you're doing or simply reply to the tweets you're mentioned in. 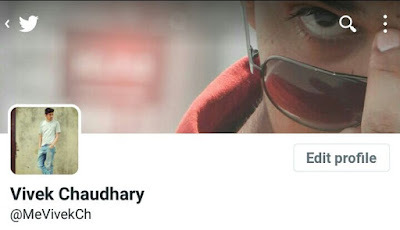 You can also connect your Facebook and Twitter accounts with each other so that if you will post on any one of them, same thing will be posted on other as well automatically. Twitter also allow users to save tweets to post them later. 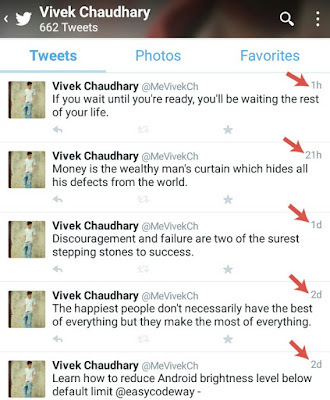 If you got some free time in a day, you can add few tweets in the list and then post them later one by one. Furthermore, you can use Twitter widget in your smartphone to quickly post tweets from your phone's home screen. Now you may be wondering about what to tweet when you are running out of ideas. There are a number of things you can tweet such as trending topics, motivation quotes, company news, product launch, blog posts and many more. Avoid re-tweeting other's tweet unless necessary. It would be irrelevant to post about politics if your profession is acting. Similarly, a person abusing other people will never fall in the category of professionals. It's not necessary to be in the box always. Yeah, you can tweet about other things as well but keep them limited and focus more on your followers choice. Link to your website - Interlink your Twitter profile and website with each other. Fill bio section - As already mentioned, bio also appears in meta description tag and it's very important. Make sure that it contains your targeted keywords. Tweet daily - You may not know that each tweet you post on Twitter was indexed by Google. The more tweets you will post, the more higher you will go in SERP. Do guest posting - You can also do guest posting on some popular blogs to build natural backlinks for your Twitter profile. Improve user engagement - Those people who get more mentions (indirectly user engagement) on Twitter usually appears higher in Google's search results page. Use follow-for-follow technique - When someone follows you, you have to follow him back and that's how follow-for-follow technique works. You can use Twitter lists to filter and target people of your interest. Use third-party services - There are a couple of third-party apps and websites available which can increase your Twitter followers free of cost. It's similar to the Facebook auto likers. All you have to do is, just give app access permission to your account and once you have gained few followers, revoke the app access. Add follow widget on your website - You can also add follow button in your website's sidebar section, about me page and in about the author section. Or you can use a pop up box. There is an option in Twitter privacy settings which let you protect your tweets so that existing and approved followers can only see them. Well if you have also protected your tweets, please make them visible to everyone. Your profile should be transparent to all people even if they don't follow you. Also make sure that it is visible in search results and indexed by Google so as to reach out maximum potential. 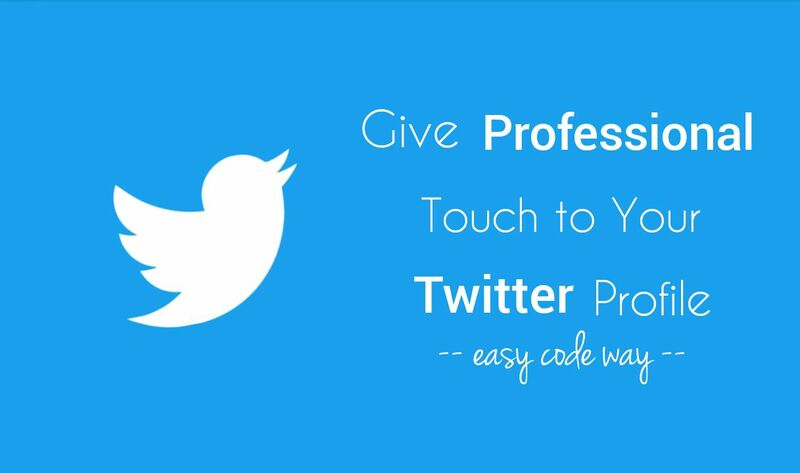 These are some of the best tips to give a professional look to your Twitter profile. Hope that you have enjoyed it. If you would like to add something in this tutorial, please do share it in the comments.